Preheat oven to 350°. Place bacon on a microwave-safe plate lined with paper towels. Cover with additional paper towels; microwave on high 3-5 minutes or until partially cooked but not crisp. In a small bowl, mix garlic, Italian seasoning, salt and pepper. Starting at one long side, cut steak horizontally in half to within 1/2 in. of opposite side. Open steak flat; cover with plastic wrap. Pound with a meat mallet to 1/4-in. thickness; remove plastic. Spread garlic mixture over steak; sprinkle with cheese. Layer with eggs and bacon to within 1 in. of edges; sprinkle with parsley. Starting with a long side of the steak, roll up jelly-roll style (along the grain); tie at 1-1/2-in. intervals with kitchen string. In a Dutch oven, heat oil over medium-high heat. 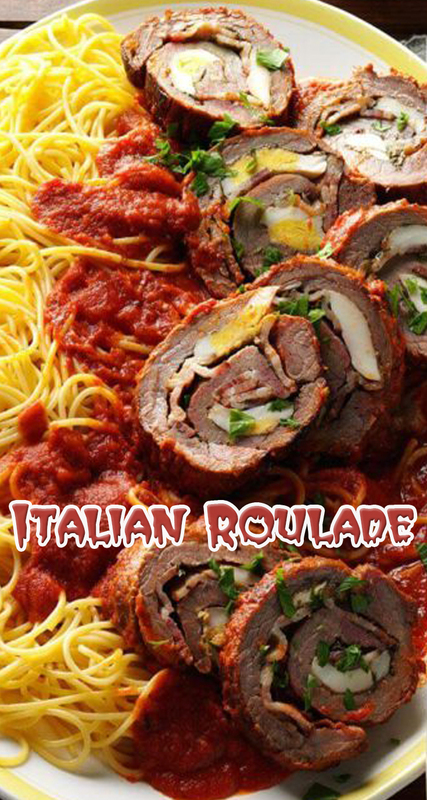 Brown roulade on all sides. Pour pasta sauce over top. Bake, covered, 1-1/2-1-3/4 hours or until meat is tender. Remove roulade from pot; remove string and cut into slices. Serve with sauce over spaghetti. Sprinkle with additional parsley.